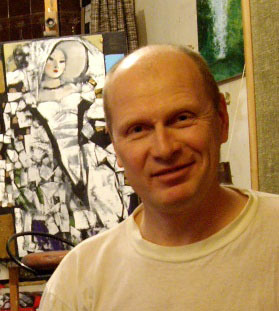 Andrei Smirnov was born in 1960 in Gorky (Nizhny Novgorod). He studied at the Gorky Theatre School. In 1994 he graduated from the St. Petersburg Academy of Arts. Smirnov took part in many Russian exhibitions, including in Moscow, Central Exhibition Hall "Manege". His works are in corporate and private collections in Russia and abroad - the U.S., China, France, Germany, Belgium, Holland, Italy, etc. Since 2006 he has been working with "Alla Bulyanskaya Gallery."